Fourth, when the U.S. military occupies other people’s land for decades as in Afghanistan, the world shows little concern (and an International Criminal Court “investigation” goes nowhere) when the global police kill with acceptable weapons, but tear gas remains an unacceptable weapon, not for use in war. However, the occupation gradually loses the name of war, and the troops now seem to have so much tear gas at their disposal that they use it on themselves. I’ve long opposed using the term “war” for things other than war. I don’t want a war on cancer for a great many reasons, including the need for a focus on prevention, the need to lose warlike habits of thought, and the need to maintain the word war for reference to, you know, war — for moral, practical, and legal reasons. The bans on a war in international law, already generally ignored, would only be further weakened by expanding what counts as a war. So, I don’t want to equate Ferguson with Iraq. And I don’t want to render more difficult the necessary abolition of war by preventing people from recognizing what war is. Yet I am up against wars that never end, and domestic policing that shares weaponry, training, and mission with wars. By dropping the “wartime” vs. “peacetime” distinction, in this way, we could lose the notion that by somehow being part one and part the other a death camp like Guantanamo escapes the legal restrictions of both. By making everywhere “peacetime” rather than “wartime,” and treating war as merely the greatest of all crimes, we would not be granting governments special wartime powers, but rather stripping them of those for good. Currently, only certain types of chemical weapons are deemed good-only-in-non-war. Some chemical weapons are already considered too evil to ever be used. In fact, certain types of chemical weapons are deemed so evil that the most implausible and unproven allegations of their use or even their very possession by the wrong party are deemed justification for massively murderous and destructive largely-non-chemical warfare. In part, this is an issue of ordinary colonial double-standards, as other nations can go right on possessing the same weapons. But in part, it is a distinction between good and bad chemical weapons. While some chemical weapons are in fact more dangerous than others, more people are killed by tear gas than were killed in a supposed Russian chemical attack in England that the British Prime Minister characterized earlier this year as “an unlawful use of force against the United Kingdom.” The legalistic distinction between good and bad chemical weapons should end. 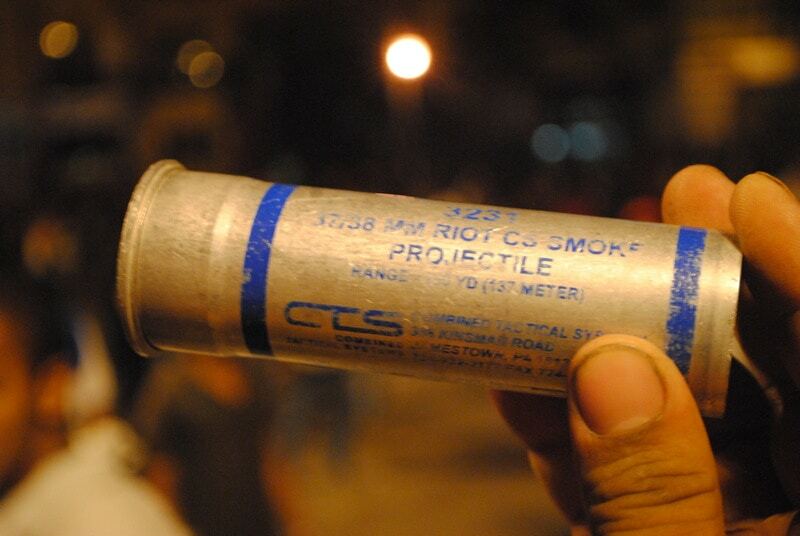 We still today think of tear gas in terms of how it has been marketed, despite what our own lying eyes have shown us. During the Civil Rights and Peace movements of the 1960s, as so many times since tear gas has not principally been used to disperse dangerous crowds. It has been used to facilitate attacks with other weapons on intentionally trapped and nonviolent crowds. It has been fired into people’s houses and churches and meeting halls to chase them out into danger, just as it was used to force people out of caves in Vietnam. It has been used as a visual cover for assaults with other weapons. It has been used to create an accepted image of a dangerous crowd, regardless of what the people choking on it are doing or were doing before the tear gassing. Tear gas motivates the wearing of masks, which alters the image and the behavior of protesters. It’s been used by SWAT teams in countless cases where knocking on a door would have worked better. It’s been used as a punishment of protesters and prisoners. It’s been used as a sport by over-eager police/soldiers. Activists have resisted, have stopped a shipment from Korea to Bahrain, have stopped a hotel in Oakland, California, from hosting a weapons bazaar. But tear gas use is on the rise around the world. Feigenbaum proposes honest scientific studies. I’m not against that. She proposes clarification of the legal status of tear gas. I’m not against that — see above. She proposes, rather desperately, that if this weapon is to be deemed a drug, then the same restrictions on conflicts of interest should apply as apply to drugs. I’m not against that. But Feigenbaum’s book actually makes a simpler and stronger case: ban tear gas entirely.